The beginning of fall really started for me with those drenching October rains. Night time comes early now as daylight savings time ended last Sunday. Our fall color foliage trees and shrubs are starting to turn color. Will they be as vivid this year? Although we don’t get as much fall color as other areas we enjoy what we have just as much. Besides we don’t get snow on Halloween. Enjoy these cool nights and warm days. That’s the combination that brings on the best fall colors. The vivid colors in a leaf are always there. They are just masked by the green chlorophyll which is busy making food by photosynthesis while the sun shines. Come autumn, shorter days and cooler temperatures cause the trees to switch into energy-storage mode and their leaves stop producing chlorophyll. For the few weeks before the leave fall to the ground, they are colored only by their natural pigments. It’s these colors – red and purple anthocyanins, yellow and orange carotenoids – that make fall foliage so glorious, sometimes anyway. Other California native plants like Western dogwood, Spicebush and Western azalea turn yellow, red or gold in the fall. A native vine that lights up with the onset of autumn is Rogers Red California grape. If you have an arbor, wall or fence that needs covering quickly this is your plant. The green and gray leaves are transformed in autumn into great draperies of rich, scarlet red leaves with clusters of summer fruit turning all shades of purple. Trees and shrubs that also provide fall color include Eastern dogwood, Chinese flame tree, Ginkgo, Idaho locust, Chinese Tallow, Chinese pistache, crape myrtle, smokebush, witch hazel, all maples, liquidambar, katsura, Eastern redbud, sumac, crabapple, goldenrain, locust, oak leaf hydrangea and barberries. Light up your garden as the light fades and the days shorten. Now through late fall is a good time to shop for plants that change colors because you can see in person just what shade of crimson, orange, scarlet or gold they will be. I’m starting to see a little fall color showing in some trees and shrubs. Might not be much but I’m always optimistic about such events. When I was in Wyoming the aspen and maples were beginning to turn red and gold and shrubs with berries acted like bird magnets. 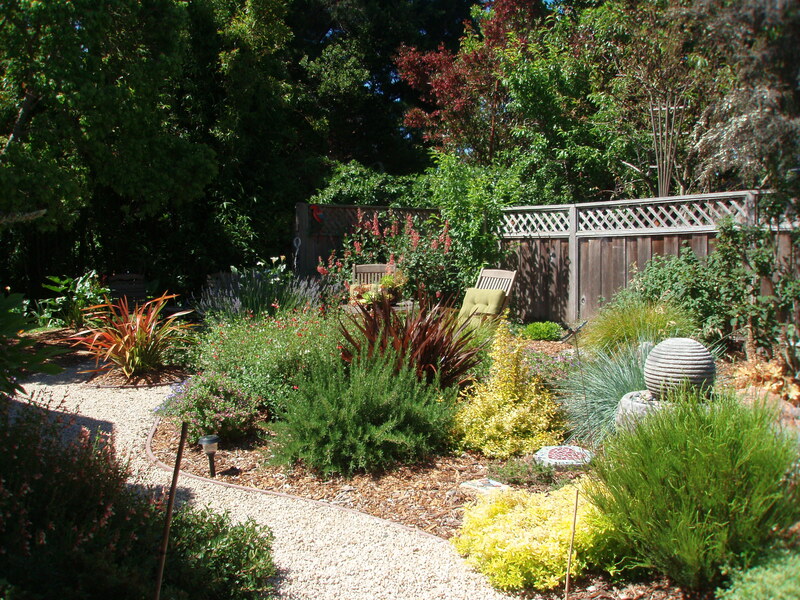 During this fall planting season look again at where a low water use plant that colors or fruits in the fall might be a great addition to your garden. What causes those fabulous fall colors? The colors are always there. They are just masked by the green chlorophyll in the leaves busy making food by photosynthesis while the sun shines. Come autumn, shorter days and cooler temperatures cause the trees to switch into energy-storage mode, at which point their leaves stop producing chlorophyll. For the few weeks before the leave fall to the ground, they are colored only by their natural pigments. It’s these colors – red and purple anthocyanins, yellow and orange carotenoids – that make fall foliage so glorious, sometimes anyway. 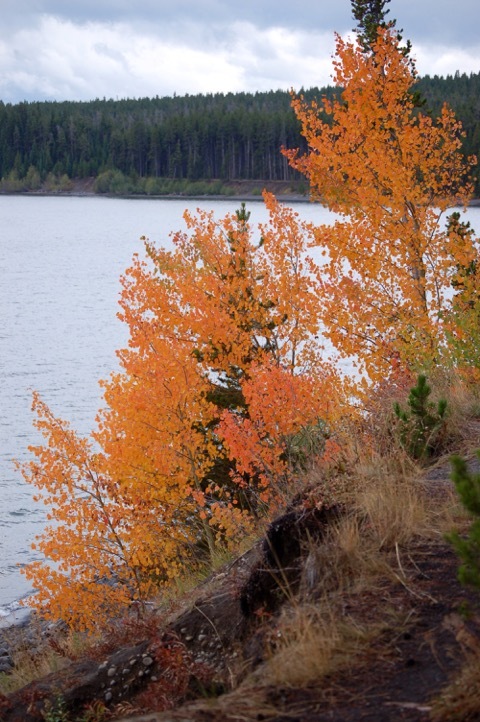 Weather conditions also play a major part in fall color. Some years the show is more dramatic than others. The best conditions for intense leaf color to develop are dry sunny days followed by cool -but not freezing – nights. This year because many trees are stressed by drought they may not put on their usual show before the leaves drop. I have some native big leaf maples that are probably not going to turn color before leaf drop. Stress can be caused by pests, disease, injury or drought. Other native plants like Spicebush and Western azalea turn yellow or gold in the fall. A native vine that lights up with the onset of autumn is Rogers Red California grape. If you have an arbor, wall or fence that needs covering quickly this is your plant. The green and gray leaves are transformed in autumn into great draperies of rich, scarlet red leaves with clusters of summer fruit turning all shades of purple. 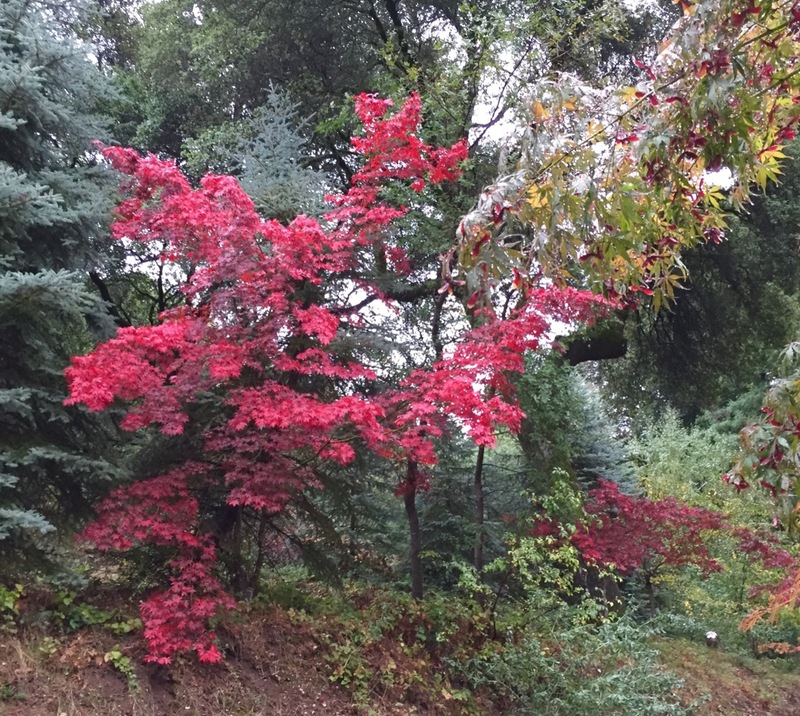 Other low water use trees and shrubs that provide fall color include Chinese flame tree, Idaho locust, Chinese Tallow, Chinese pistache, Crape Myrtle and Smoke tree. A great tree for the gardener interested in edibles is the Fuyu persimmon. 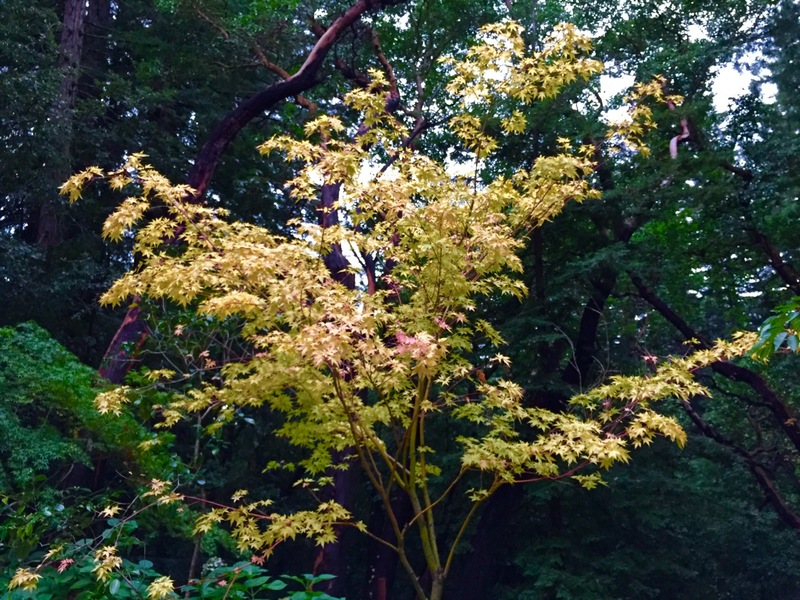 This beautiful small tree is ornamental with glossy green leaves and also offers a dramatic fall display in shades of yellow, orange and red. Bright orange fruit begins to develop in late October and clings to bare branches usually through December. The tree looks more like it’s covered with holiday ornaments than fruit. And have you priced persimmons in the store lately? Blueberries are a must for the edible gardener. They make a beautiful hedge and provide showy red or yellow fall color. Because of our colder winters here in the mountains, we can grow both northern highbush which are self-fertile and southern highbush which produce better with another type to pollinize them. 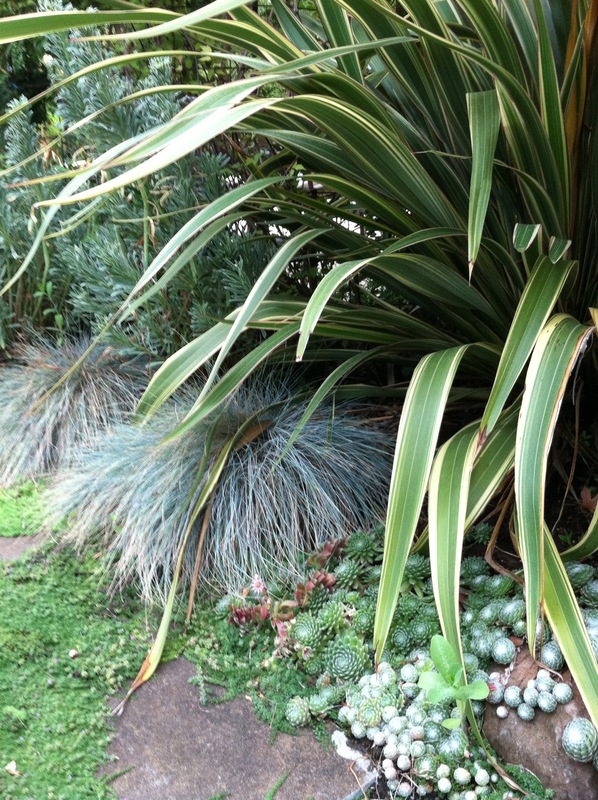 They can be great foundation plants around the home as well as in the garden. Blueberries are low maintenance. Just a light pruning once a year after the season’s harvest and the shrubs will maintain a tidy appearance. Most are pest and disease resistant and since they don’t have thorns, they are child and pet-friendly. Now through late fall is a good time to shop for trees that change colors because you can see in person just what shade of crimson, orange, scarlet or gold they will be. 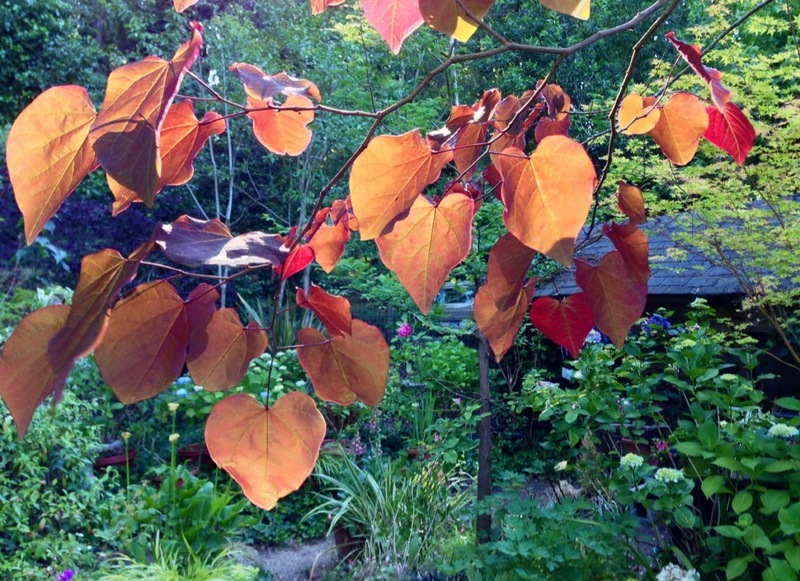 Outside my window, the Forest Pansy Redbud has started to display its spectacular burnt orange fall color. There’s a suet feeder hanging from the branches so I get to enjoy the antics of the Pygmy Nuthatches, Purple Finches and the Chestnut-backed Chickadees all day long as I watch the changing colors of the foliage. Out back I have a Catawba Crape Myrtle also starting to show fall color. Its leaves are turning a rich butterscotch shade which is lovely but not the reddish-orange described in the books. 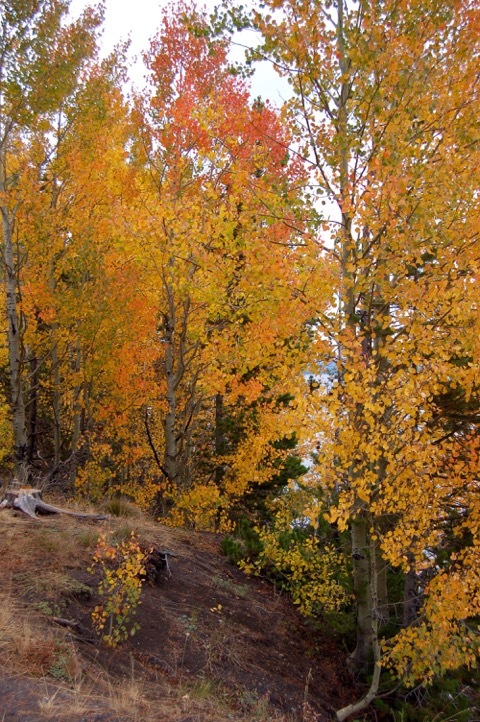 What causes fall color to vary from plant to plant? How does location in the garden, weather, climate and growing conditions affect what you see each fall? The brilliant fall color we see in the leaves of trees and plants is always there. It’s just masked by chlorophyll during the growing season as the plant is busy making food while the sun shines during photosynthesis. Come autumn, shorter days and cooler temperatures cause the trees to switch into energy-storage mode, at which point their leaves stop producing chlorophyll. For the few weeks before the leave fall to the ground, they are colored only by their natural pigments. It’s these colors – red and purple anthocyanins and yellow and orange carotenoids that make fall foliage so glorious. Some years the show is more dramatic than others. The best conditions for intense leaf color to develop are dry sunny days followed by cool, but not freezing nights. A warm, wet autumn will almost surely result in less-than-spectacular foliage because the process of chlorophyll loss will be less consistent. Freezing temperatures or winds meanwhile can cause leaves to drop suddenly denying them opportunity to enter their slow, colorful dormancy. Finally, trees that are under stress because of pests, disease, injury or drought may drop their leaves with no color change at all. 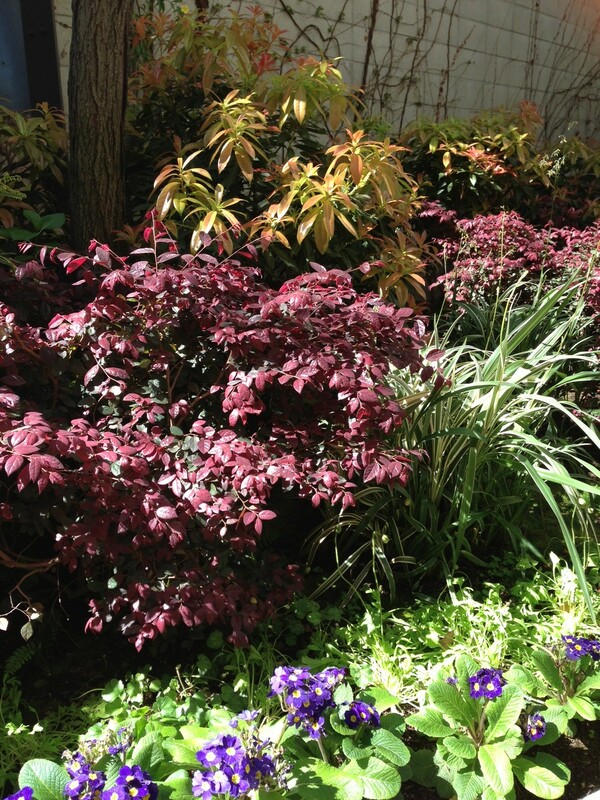 So if your garden becomes shady early in the fall this may result in less vivid fall foliage. If your trees are stressed by drought like this year you may not get the usual colorful fall display. These and the above factors all affect the intensity of fall foliage colors. 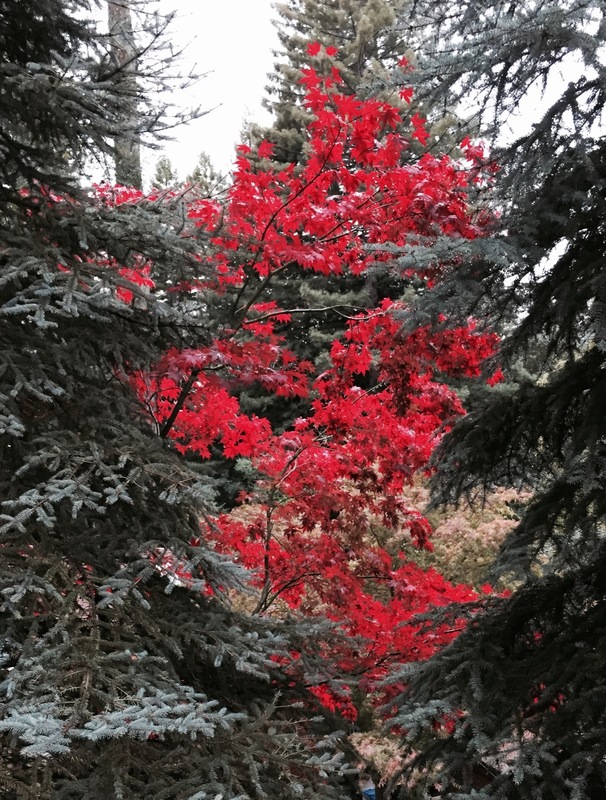 Now is a good time to shop for plants and trees that can punch up the color of fall in your garden. Seeing your new addition in person will show you exactly what color you are going to get. Sure Autumn Gold Ginkgo will probably always color up bright yellow and Sango Kaku Japanese maples will show off their characteristic golden foliage but the fall color of Purple Smoke Bush, Katsura tree, Witch Hazel, Pomegranate, Oakleaf Hydrangea and Blueberry, to name just a few, can vary. I received an email from someone new to the area about when to expect our first frost. I’ve kept a weather journal since 1992 and based on my records occasionally we get a light frost at the end of October. Mostly though, the earliest frost has occurred about second week of November with late November being the most common. Be prepared by moving frost tender plants under overhangs if possible or having frost blankets (not plastic) ready to cover delicate plants. Need to move a plant or install plants out of containers and into the garden soil? Now through February offers the best time to do this. Soils are still warm at this time of year which helps new roots get established quicker than in later winter. Prepare the new location first before excavating any plant. Dig a hole twice as wide as the rootball, but just the same depth. Use a sharp spade to make clean cuts through roots. Cut roots will form new, dense and healthy roots. Before replanting, especially from a container, check for roots that have circled the interior of the pot. These must be tugged loose and straightened when planted. Don’t be shy about loosening roots. When replanting be certain to keep the rootball at the same level it was and don’t add soil over the rootball. Most plants need oxygen at the soil level.